Huge growth is in business is extremely rare. To produce extreme results requires extreme behavior. Like expecting to lose weight by sprinkling a magic powder on your food, don’t expect to make the leap to great productivity and revenue with ease. Killing time is a very apt expression. Yet, we discuss poor productivity as a time management problem; it is not. Low productivity is mostly an ambition problem – you don’t have enough strong reasons to do what’s necessary. If your life depended on your behavior, you would behave better. Pretend your child would lose a finger if you didn’t perform at peak efficiency -- you will get stuff done. Goal: Find the right motivation for you. Case study in ambition: for years, Harvey Firestone never saw a man without money without turning over in his mind how he could transfer some of that money into his corporate stock. Approach extreme productivity with the same ambition: Be on the hunt every day for ways to do be more productive. Where does the time go? You can’t manage what you don’t measure. Measure time daily in Excel or something else, then analyze at the end of the week. This can deliver an instant breakthrough. · Think: What are the enemies and obstacles of your ambition? Kill them. You must be willing to defend your time aggressively; be intolerant of anything that screws up your productivity, including your own (in)actions. · Immediate: The start matters most. It’s better to get started in the wrong direction than to never start; you can fix the direction more easily than inaction. The best time to plant an oak tree was 25 years ago; the next best time is right now. There is enormous power in starting. · Visible: it puts you on the spot and conveys decisions to others when your action is visible to others. · Simultaneous, not sequential: You’ve been conditioned that everything ought to be Step 1, Step 2, etc. Perpetual, controlled chaos is how most high-achieving, high earners live. You never reach the perfect time for things to happen in order, so start doing the right things right away. Most people never complete all the steps anyway. When Schwarzenegger came to America he invested in real estate as soon as he came to America, even though he was essentially homeless; if he had waited, he would not be wealthy now. · Massive: Put a lot of stuff in motion, with urgency. · Urgent: The quickest way to create a product is to sell it with a shipping date before it’s made. Also, think of how fast a football team can move the ball during the 2:00 drill; why not play the 2:00 drill every time? · Synergistic: How can you make the same piece of work, relationship, etc. do more than one thing? How many benefits can you get from each action? Doing the wrong work entirely, not based on the facts of where the money actually comes from; doing trivial, worthless work. Example: You may think you need a better ad, but if your refund rate is 22%, you need to focus on fixing the product. Lost minutes adding up to lost weeks. Example: 10 minutes a day stopping at Starbucks x 300 working days a year = 3,000 minutes … 50 hours … more than one full working week LOST every year. Confusing the business with the deliverables. The business you run is “the marketing of ____.” Leverage comes when you focus on driving people through the door – the marketing -- not on what happens when people get in the door, i.e., the deliverables. Failure Environments. Don’t put yourself in a place where you have to battle against bad influence to get good things done. Example: if you’re on a diet and can’t resist eating donuts, don’t go where donuts are. Your time-draining temptation may be the iPhone, email, whatever. Put yourself in a a success environment – a place that’s conducive to what you want to accomplish. Poor, undisciplined work habits. Don’t get on the phone or go to a meeting unprepared. Woody Allen was only partially right about just showing up. Example: 14 financial planners have met with Dan trying to manage his money, but only one has shown up prepared. In all but two instances, they scheduled appointments in noisy restaurants/public places they did not control; only one person had Googled to learn about him. · Starting from scratch and a blank slate is bad. The less historical knowledge you have, the harder and slower your present work is. Use past work as starting points for future work. · Disrupted rhythm is bad. Starting and stopping kills productivity. Example: Dan has never seen a horse race stop in the middle; start, go, finish. · If you’re going to work, make every minute as productive as possible. Kill a sky full of birds with one stone. Example: When hired to give a speech, what will you do before, during, after the speech? Can you invite guests to attend, see you, and be suitably impressed to book you later, for example? · Use tight time allotments, to impose discipline on others and yourself. Leave no time for yourself or others to waste. · Script everything – plan every minute and every hour of every day, as if you were shooting a big-budget movie and every minute cost big bucks. Because it does. Example: A guy running chain of tanning booths saw that his video rental shops were dying and decided to put tanning booths in. Example: Joan Rivers started her jewelry business on QVC because she couldn’t get a job and needed to make money; it was a Plan B invented out of adversity. Example: Disney’s original deal with ABC was driven when they were out of money just before opening of Disney World and signed 5-year deal; it ended up being a great deal because ABC advertised Disney every Sunday night. "Plan B ending up better than Plan A" is common in business, so Plan B is not to be feared. In fact, you should always ask what your Plan B will be -- it’s a good creative question. Example: the book, “What a Way to Make a Living: the Lyman Wood Story” about a guy who started a mail order religion out of necessity. He had been successful in mail order, selling lucky rabbit’s feet via print ads; they made big claims for the rabbit’s feet re: getting good luck, and the U.S. Postal Inspectors showed up to investigate the claims. Because there was no regulation for religion (then or now) they took out the rabbit’s feet, kept the incantations and sold them as religious tracts, which skirted the law successfully. This was a creative, profitable solution. Another story: Tupperware was dying with ugly products and facing adversity. It drove them to go somewhere that was at least a decade behind the U.S. culturally –South America and Asia -- where they prospered with that they had and used the money to come back here and create better products; to this day, they do 70% of revenue overseas. Without this thinking, Tupperware would be out of business now. The stories of your pain are incredibly valuable, because the one thing all people have in common is adversity. So if you want to connect with people, a story of adversity has widespread, valuable appeal – in the millions. The first Chicken Soup book was rejected by 33 publishers and 17 agents. The adversity that Mark Victor Hansen and Jack Canfield overcame through all the rejection and the perseverance has helped them win credibility with authors and other people they sold other products to. Example: the founders of Amway used to tell about their 15+ failed businesses as a way to bond with audiences and build credibility. When other people screw up, there is opportunity for you. Example: Sellers of gold thrive in a recession. Example: Joe Costman realized would hunt for under-marketed products and find new channels of distribution. His biggest success was The Ant Farm, which had been sold via school supply catalogs as a teaching aid. He sold it via print ads directly to kids all over America and made millions. Moral: Look at your own business this way, for untapped channels of distribution. More ideas like these in my Free Report, Guaranteed Marketing for Service Business Owners. 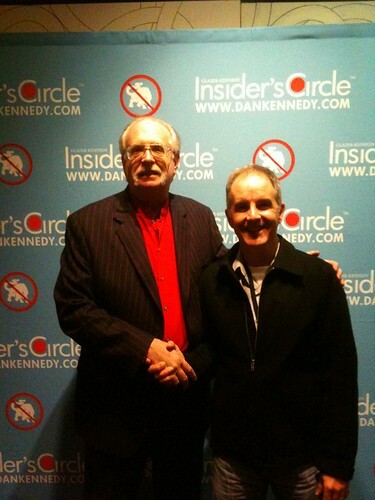 That's Dan Kennedy and me at Day 1 of the 2011 SuperConference in Chicago. Dan is one of the two biggest influences in my business life, along with Jay Abraham. It may help to think of Jay as "Mr. B-52" and Dan as "Mr. Boots on the Ground" -- their approaches complement each other perfectly. Anyway, I'm in town for Dan's annual SuperConference, where direct-marketing practitioners come to sharpen their skills. I'll be sharing my notes and photos over the coming days, starting with today's opening remarks by Dan about how to market the Glazer-Kennedy way. Here are the key transformations that happen to Kennedy students who pay attention and take action. Move from being doer of the thing to marketer of the thing. The doing of the thing is the least valuable part of any business and the easiest to replace, in most cases. Example: Houdini was a master marketer of magic and profited wildly; others, like Howard Thurston, were better doers of magic and profited far less. Move from being marketer to the direct marketer of the thing, using mail-order based marketing strategies and tactics. Results are measured objectively, empirically, and ruthlessly. David Ogilvy said that only the mail-order advertisers knew what they were doing; this is still correct. Become a direct marketer of anything, using direct-marketing skills to move into any industry. Example: Ecommerce marketer of anti-aging products, Ed O’Keefe, started as a marketing advisor to dentists (never having been a dentist). Move from being their own boss to being an entrepreneur. They move from owning a business that never changes to developing it by adding pieces, later diversifying into serial businesses. Move from merchant or peddler to rancher. The merchant/peddler goes after customers to make sales; when they wake up, they think: "Who can I go find or get in the door today?" Flip this. Ranchers make sales to get customers; the sale is not the objective, it is the path to equity that comes by creating a herd of long-term customers. You are in the income-at-will position. Think of your expenses or income needs as an invoice. You can send them to your herd, in the form of a new product or promotion. Your herd of customers is your only real equity. You are in the “toll” position because others will pay for access to your herd. You have your own currency because you can “print your own money” by monetizing the media you control (newsletters, emails, web site, etc.) via joint ventures, etc. Move from generalist to specialist. This moves you up the money pyramid. Example: a specialist doctor makes more than a general practitioner. Move from casual "skimmer" to serious student. Most people go through life skimming, not seriously. The majority of Americans do not read a single book in a year. Donald Trump once asked Dan 3 questions backstage at an event; two were about how the money at the event was being made; the third was: "What 3 books are you reading now?" Only serious students read that many books at once, so Trump wanted to find out if he was talking to one. How serious are you? It's not enough to offer superior quality, fast delivery, and a great price. Those are but three parts of the success formula. Your service must "wow" clients if you want the repeat and referral sales that lead to lasting success in business. How to do it? Take a page from Disney. Specifically, you can wow your clients by exceeding their expectations on the little things. And it starts with your answers to obvious questions you hear every day. Think about it. You're a Disney theme park cast member picking up trash and a guest comes along and asks, "What time is the 3:00 parade?" What does it mean? More important, what is your reply? For one thing, consider that the parade begins on one end of the park in Frontierland, and then moves to Liberty Square, up in front of the castle, and on down Main Street. It actually takes the better part of an hour for the parade to completely go through. The question on its own has merit. But the appropriate answer lies in understanding the guest. This is a chance to provide a one-on-one experience for the guest. What we really want to do is to think why the guest is asking the question in that manner. Then we want to respond appropriately. Perhaps the guest wants to go on more rides and wants to make the parade as late as possible. Maybe the guest is looking for a place to sit down, or a place in the shade during the parade. Perhaps the guest is looking for a place where it isn't so crowded that their kids might be able to see. You have to take time and inquire. You might ask: "Well, where are you planning to be at that time?" They might reply, "Well we were going to head over to Goofy's Barnstormer." Your response might be, "Well perhaps you might want to take the train before 3:00 p.m. and stake out a place near Town's Square. There will probably still be some good places to see the parade without having to wait too long." That's so much better than simply stating "3:00 o'clock." But of course, this article isn't just about Disney. It's about your business as well. So ask yourself: What is your 3:00 parade question? What is the obvious kind of question your customers ask, and what does it mean? So ... what's the most obvious question you hear each week? Example obvious question: "What services do you provide?" Example obvious answer: "We're a lawn service company -- we cut your grass once a week." But ... what if you tried to understand the person first, like the Disney employee above, before you replied? Perhaps the questioner had a bad experience with a lawn service and now wants a better one ... or they've never used a lawn service before ... or they need someone to cut the grass for their mother, who was just diagnosed with Alzheimer's. Each of your prospects has different reasons for asking, "What services do you provide?" and one answer won't appeal to them all. So, like the Disney employee, take the time to learn. Start by replying: "What did you need help with, exactly?" Let your prospects tell you what they need. Their obvious questions will narrow down into specific desires, which you can fill with specific answers -- answers that none of your competitors probably took the trouble to provide. That's one way to really serve your clients, "wow" them, and ensure the kind of repeat and referral business that Disney enjoys. It's not just your product or service that you're selling, but everything the client gets when s/he writes you a check: the preliminary consultation, the product/service itself, the training and instructions that go with it, the follow-up support, etc. Everything you give the client in exchange for their money is The Offer. And your offer had better be good. So good, in fact, that it's Google-proof. Do this: Google the most common search terms in your industry. See what comes up from your competitors. Look at their offers. How many of them are making attractive offers to your prospects? How many of those offers are more attractive than yours? Be honest. If you find competitors whose offers are better than yours, your prospects will find them, too. So ... do whatever it takes to create compelling offers. Offer a better consultation, free special reports, more product, more service, better training, better followup, etc. -- for the same price. In any transaction, the lower the risk, the more likely it is to happen. So, if you don't offer a money-back guarantee of some sort, start now. If you're diffident, try a guarantee in one part of your business to prove that the concept works, then roll it out to your main products or services. Fact: You already offer a money-back guarantee, you just don't know it. It's fairly simple for a buyer to dispute a charge with their credit card company or PayPal, and you don't get paid. Plus, in the age of Twitter, Facebook, LinkedIn, Yelp, and Angie's List, if an unhappy client starts telling the world how rotten your business is, you will do almost anything to stop them from damaging your reputation, up to and including refunding their money. Why wait for a public relations disaster to strike? Offer a money-back guarantee. 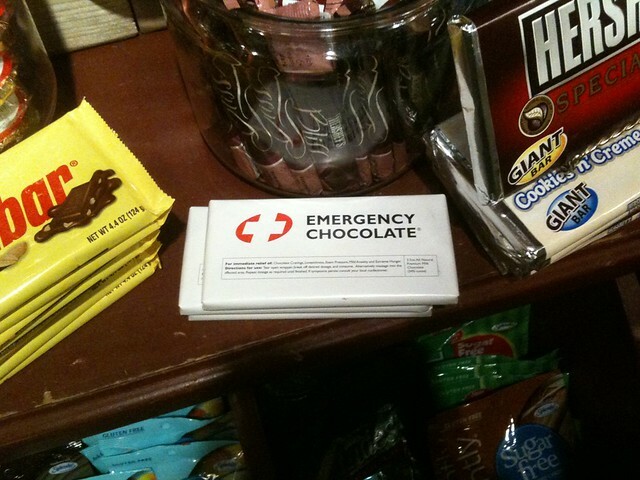 You have to admire how well "Emergency Chocolate" is positioned to stand out -- literally -- in a crowded category. Here's the lesson: You can succeed in almost any market, by sidestepping the competition's strengths and positioning yourself as an attractive alternative. In other words, pick a niche you want to own and can own. Then own that niche. Example: Papa John's and Domino's pretty much own the home delivery niche among pizza restaurants. So Papa Murphy's sidesteps delivery and targets cost-conscious buyers, with a less-expensive "take 'n' bake" pizza alternative -- and has grown 42% over the past three years, according to Inc. magazine. Whatever your business makes or sells, there are plenty of opportunities to stand out, even in a crowded market. To succeed, sidestep the competition's strengths, by targeting the right buyers in the right niche with the right message -- one that plays to your strengths. If you own a small business, you're in the Twin Cities, and it's not yet April 21, I hope to see you at my seminar to build your business and benefit the Japan earthquake victims, on April 21. Where's the Revenue Beneath Your Feet? You might think of McDonald’s as a chain of fast-food restaurants. But that's only half right. There's a second, very lucrative source of revenue for McDonald's that's hidden from view: real estate. This practice continues today, and with an expanse of stores in prominent locations across the globe, the McDonald’s Corporation now owns more land than the Catholic Church. So. What revenue is hidden from view in your business, like the land under McDonald's? If you're like most small business owners, that hidden revenue is found in your current clients. Your current clients are the source of your easiest sales (they already trust you), your highest profits ($0 cost of acquisition), and your most referrals (they know you enough to recommend you). Bonus: Your communications with clients are hidden from view. Unlike ads on Google or a web site, no competitor can copy what you say to clients on a phone call or a handwritten thank-you note, for example. So, take a look underneath your business and pay more attention to your clients. Find new ways to serve them faster and better. Your clients will pay you back. If you own a small business, you're in the Twin Cities, and it's not yet April 21, I hope to see you at my seminar to build your business and benefit the Japan tsunami victims. Friends, Family, Referrals -- Oh, My! You've heard how important it is to ask for referrals, but what about rewarding referrals? That's just as vital to the success of your business, but often overlooked. Because, whether it's your child getting popcorn for doing his homework or a sales rep getting a trip to Hawaii for beating her quota, you always get more of any behavior you reward. The same goes for referrals: If you want more of them, reward them. Back in the 1990s, MCI built a wildly successful phone company largely by rewarding referrals. Their MCI "Friends and Family" program, launched in 1991, offered 20% savings on long distance for calls made from one MCI customer to another. Thus, existing customers had a powerful incentive -- 20% savings -- to convince others to join MCI. Referrals poured in and business boomed, because MCI smartly rewarded referrals. So, don't just ask for referrals -- that's elementary. Reward referrals -- that's smart. Stuck for ideas? Copy MCI's example. Offer clients a 20% discount on their next order for every person they refer to you AND offer the new client a 20% discount on their first order. You can do better, I'm sure, but this probably better than what you're doing now. 10 Reasons to Attend "21 Quick Ways to Get More Clients Fast"
Do you own a small business in the Twin Cities? 1. Build Your Business 21 Ways. In two fast-paced hours, you will discover 21 great ways to get more revenue and enjoy more time off in your business, by getting all the new clients you can handle. Any one of these proven marketing methods could increase your revenue by 10%, 25%, or more. How fast could you boost your profits if you use all 21? 2. Get $1,500 in Training for Pennies on the Dollar. Two weeks after this seminar, I'm getting paid $1,500 to deliver the same marketing material to a Fortune 1000 firm. You will learn exactly what they learn, but for a tiny fraction of the investment! 3. Free: Signed Copy of my New Book, 21 Quick Ways to Get More Clients! A free, signed copy has been set aside for you at the seminar, if you're one of the first 15 to register. I hope you claim your copy and use it to grow your business faster! 4. Free: "Conveyor-Belt" Referral System that delivers new clients automatically -- 3 ways. You'll receive a sure-fire formula to turn your current clients into a sales force, one that sends you qualified leads like clockwork. Your life just got easier! 5. Free: Two "Force Multiplier" marketing tricks, each of which can double your sales. There's a simple phone call you can make or email you can send. If you do either one every day, you could increase your revenues by 100% -- or more. Which one is right for you? 6. Free: The Simple "Thank You" Marketing Strategy that works wonders, for pennies a day. Learn how a single, hand-written letter, mailed to one customer, produced a 39,900% return on investment. You can mail the same letter, the same day it is revealed to you. 7. Help the Tsunami Victims in Japan. 10% of all ticket sales will be donated to the Salvation Army and their relief effort in Japan. 8. You Can NOT Make a Mistake, thanks to my money-back guarantee. You will love every minute of this learning session, or pay nothing. 9. You Save 50% when you register. Simply visit the web site below and enter Discount Code: MYBLOG. 10. Your Friends Save 50%, too. Just give them this web address and Discount Code: MYBLOG by email, LinkedIn, Facebook, phone, etc.! ... then join me on Thursday, April 21, 2011, for my all-new seminar: 21 Quick Ways to Get More Clients Fast. Special: Save 50% off your registration when you use discount code BLOG. When you attend, you'll help build your business and you'll help others -- 10% of all ticket sales are being donated to aid victims of the tsunami in Japan (where I used to live). I hope to see you on April 21! Not in the TC? You can still grab a copy of my new book, 21 Quick Ways to Get More Clients. 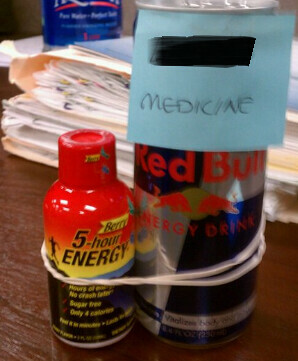 Fun fact: one can of 5-Hour Energy drink plus one can of Red Bull equals 10 hours of energy. Do not ask how I know this. But do understand this: the Red Bull acts as a force multiplier. In military terms, a force multiplier is anything that increases (multiplies) the effectiveness of an item or group. For example, if a tank enables 10 men to accomplish the same results of a team of 50 men without one, then the tank is a force multiplier, with a value of 5. In our 10-hour energy example, the Red Bull is a force multiplier, with a value of two. What is the force multiplier in your marketing? Example: In my business -- and probably yours, too -- it's a simple phone call. By itself, an email or sales letter sent to prospects will typically get X% to buy. But when I pick up the phone and call to follow up, I typically get 2X% to buy. So, a phone call is a force multiplier, with a value of two. If not a phone call, your force multiplier may be an in-person visit, a thank-you note, or some other action. There is at least one force multiplier in your marketing. Find it. Use it. If not, you may miss out on double or triple your results. 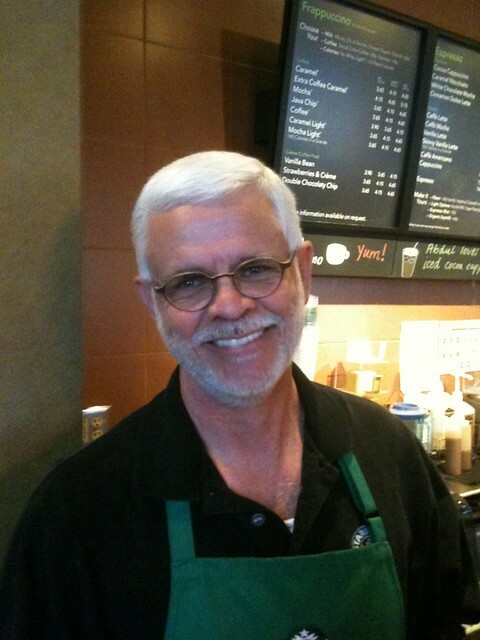 This is Tim, a barista at the Starbucks on Excelsior Blvd. in St. Louis Park, MN. Tim is a money magnet for Starbucks. His boss ought to put him in charge of customer service, if he hasn't already. And whatever Tim is getting paid, it's not enough. On Friday, after dropping my car at the repair shop, I walked to a Starbucks across the street and wrote for two hours. That's where I noticed Tim, working some customer service magic. Not only was Tim pleasant and upbeat, he knew at least 50% of the customers by name (I was counting). Can you imagine how many more people must come back to this Starbucks every day, knowing they're going to be welcomed by name? Judging by the number of people he greeted that way, it's a large, profitable number. 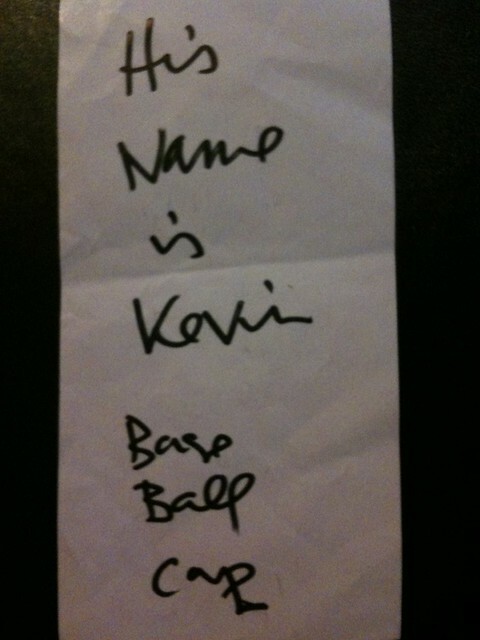 After meeting a new customer, he asks for their name and writes it down, along with one identifying feature of that person, on the store copy of their receipt. Later in the day, he looks at his notes again, to reinforce names and faces in his memory. Tim said this method isn't perfect, but it works often enough. Now. Why is Tim worth more than whatever he's paid? Because he's doing more than he's paid to do. A lot more. Do you think "memorizing customer names" is part of the Starbucks employee handbook? I don't. Yet, Tim has gone well beyond his job description, by taking the time and effort to make customers feel at home by learning their names. You can build a very successful business if you have enough Tims. But there's another lesson here: If you own or manage a service business, you can increase your own paycheck this week, simply by going beyond what your clients expect. If your business has walk-ins, do what it takes to memorize the names and faces of your regulars. Tim has given you a system to use. Copy it, or find one that works for you. But do it. If your business serves clients by email or phone, it's even easier. Get a database, like SalesForce.com, ACT, or GoldMine, and start tracking every conversation you have with prospects and clients. I've logged my phone calls since 1998. It never fails to impress a client when you can recall for them a conversation or email exchange from 9 months earlier, thanks to the notes in your database. So ... what's in a name? Everything you need to exceed expectations, delight your clients, and earn their repeat and referral business.